3 dresses in 3 days - Stop staring and start sewing! Well I finished the girls dresses and still had time to get ready. Usually I'm snipping threads as we're running out the door so I'm patting myself on the back for pulling it together a little better this time (and for teaching the girls how to snip their own threads!). Here is Olivia's dress (Simplicity 3867). She was very happy with the outcome and I think it's festive enough for Christmas (in Arizona you don't need sleeves on your Christmas dress!) but versatile enough for other times of the year. This dress went together surprisingly fast especially since I'd never used the pattern before. The fabric is from Mary Engelbreit's Isn't Christmas Jolly? line (on sale for 5.50 yd) and I think the dots make it sweet but spunky. Do you love her shoes?! I made Peety's (Simplicity 2886) last (only because I made her's first the last time and I'm trying to be fair) and it was pretty fast too. Joey took the kids out of the house so I could have some peace and quiet while sewing so I popped in Grease and went to work. I saw that movie countless times when it first came out and never realized how saucy some of the lyrics are. Anyway, this dress was fun because it zips up the side and I've never done a side zip before. Very nice detail. Oh, and this dress is made from taffeta (50% off!!) which wasn't awful but a little bit trickier than cotton. I needed to adjust my tension more and it was still a little puckery. I think this dress would have been very boring if I hadn't added the upwards ruffle under the bodice (an idea I hijacked from Kay Whitt's amazing Juliet tunic). 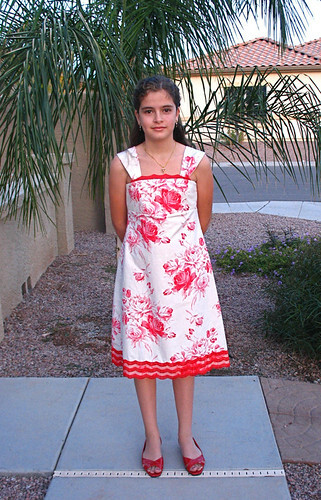 For Sofia's dress I used New Look 6749 which is the same on I used for the junior bridesmaids dresses I did last month. I figured it would go together fast since I had already done this pattern and I was right. Once I got the bodice fitted the rest was done in a flash. I used Tanya Whelan's Ava Rose fabric and I'm very happy with the finished look (and the $4.00 shoes!). I think Sofia was happy too even though she would rather wear blue jeans and a plaid flannel shirt. So here they are together. 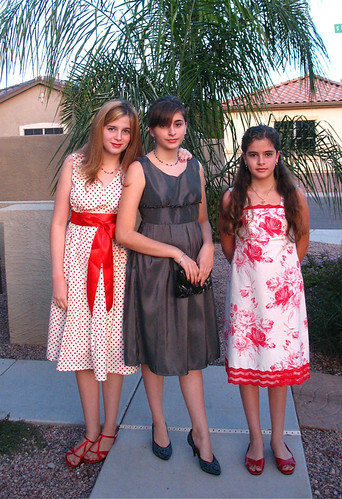 Too old to wear matching dresses (I miss those days!) but pretty girls nonetheless. And in store news, David Walker's Robots fabric will be here tomorrow with some of Tanya Whelan's Darla. I'm going to start shipping the Robots out tomorrow and the Darla on Wednesday (when the rest of it arrives). It's already in the store for pre-orders (and already selling so don't wait too long!). And everything is still 15% off with the coupon code "shelfspace08".